The very first dividend stock that my wife and I purchased was 25 shares of Consolidated Edison (ED) back in 2008. At the time, we didn’t even realize these 25 shares were to be the start of our dividend income portfolio. As of July 24th, 2018 … we will have owned these shares for a decade. Over those 10 years, we will have earned $810.55 in dividend income … which covers about 83% of our original cost. If this trend continues, we will have earned back our entire investment within the next 2 years. Overall, that is about an 11 year time-line for doubling our investment. So how did our small investment of 25 shares in this company manage to double in a little over a decade? By using a powerful tool called compounding interest. When it comes to dividend stocks, I like to think of it as – compounding dividends. Building a compounding dividend investment portfolio can create a sustainable income stream overtime. This is done by reinvesting your dividends earned back into additional shares of stock. Those shares can be bought either through Dividend Reinvestment Plans (DRiP) or by pooling up multiple dividend payments to purchase individual shares of a stock. Those individual shares purchased could either be the same stock or possibly from a different company that pays dividends. Both methods of compounding your dividends have advantages. Personally, I prefer to setup DRiP’s on the majority of our dividend stocks to add partial shares throughout the year. That is exactly what my wife and I did in order to compound our Consolidated Edison (ED) dividend income stream. Over the past decade (plus), we have automatically reinvested every penny earned in dividends from ED back into additional shares of stock. At this time of this writing, we have managed to add an additional 13+ shares of ED stock from that $800+ of dividend income. Not only can you let your dividends compound when a payment comes in … most quality dividend paying companies will give you a raise every year too. A company that consistently raises their dividend every year will help to accelerate that awesome dividend growth. Take for example our shares of Consolidated Edison (ED). The company has been consistently raising their annual dividends for over the past 40 years! Since we first purchased our shares back in 2008, the company has raised it’s dividend every single year. The 10 year dividend growth rate average for ED has been 1.8%. That means on average, not only are we compounding our dividends through reinvestment … we are also compounding our dividend income by almost 2% each year from a company raise. This is the main reason why my wife and I prefer to build a diversified portfolio of dividend stocks. We not only compound our dividend income but increase the growth by getting a nice raise once a year. 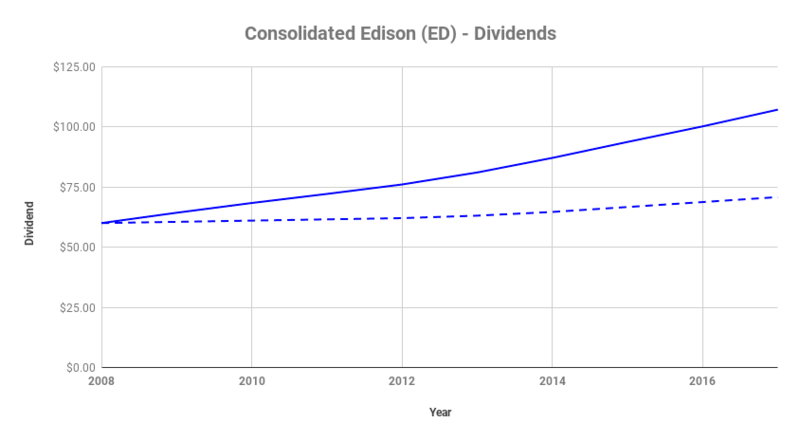 Let’s take a look at our Consolidated Edison (ED) shares and how they have built up a nice income stream over the past 10 years. First of all … buying shares of ED stock automatically locked in almost a 2% dividend growth rate per year. That growth was simply from owning the company and never selling. Since the company consistently raises it’s dividend each year … we locked in that return without lifting a finger. Note – The dividend growth rate for ED is actually on the low end for companies that we currently own. Typically, the sweet spot for quality dividend paying companies is a 6% dividend growth rate. The first full year of dividend income received from Consolidated Edison was $60.08 for the 25 shares we purchased. That equates to a yield on the cost of 6.1% for the shares … which is rather high for purchasing a new stock. But keep in mind it was about 10 years ago … right around the time of the financial crisis. For a moment … let’s assume we wanted to spend our $60.08 in dividend income that first year. And actually, we needed that $60 to spend every year after that. So hypothetically … no money was reinvested the past 10 years. Based on the annual dividend increase from the company, our dividend income would have climbed to $70.86 this past year. That is a $10.78 increase in annual income or 18%. Based on the percentage, that seems like a pretty cool increase all from company dividend hikes. Plus I would have gotten that extra $60 to $70 of extra cash to spend every year. This article is not to debate about DRiP versus reinvesting dividend in another stock. What this article is about is the awesome power of dividend reinvestment. This is a critical step in building a sustainable dividend income portfolio. It doesn’t necessarily matter the method for reinvestment (as long as fee’s are low) … but just that you reinvest your dividends. In my example earlier on Consolidated Edison (ED) shares … we chose to setup a dividend reinvestment plan. In our first full year, we still earned the same $60.08 in dividend income. However, things changed after that as we continually added new partial shares of ED stock to our portfolio every time we got a dividend. The chart below shows two different scenarios of buying 25 shares of ED stock back in 2008. The first column (Dividend Income with NO DRiP) represents a “what-if” scenario of simply collecting dividend checks with no reinvestment. 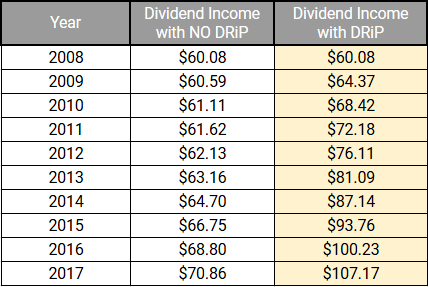 The second column (Dividend Income with DRiP) is our actual earning each year with reinvestment. 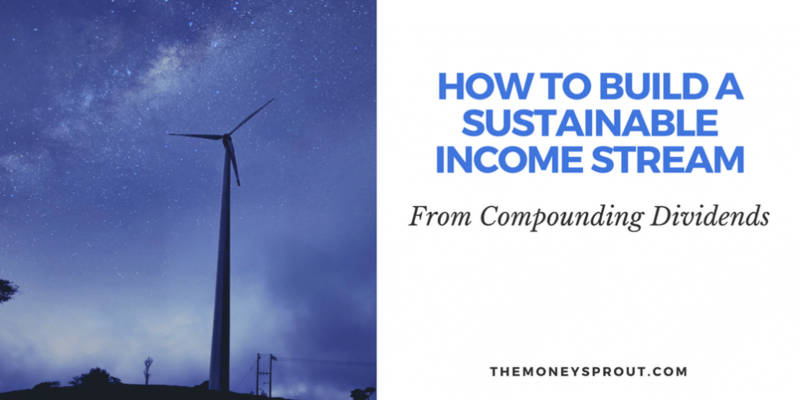 Over the past 10 years … that sustainable income stream has grown to $107.17 this past year. That is an extra $36.31 of annual income compared to our scenario where we spent our dividends each year. Sure we didn’t have an extra $60+ to spend each year … but now we have an extra $107.17 to spend if we want to! We have grown our annual dividend income from ED now by over 70%. Here is another graphical look at how the dividend income grows with reinvestment compared to no DRiP. The solid blue line represents our actual income versus the dotted blue line which shows no DRiP. The awesome thing is that we really didn’t have to do that much to earn this income either. The company raises came in … just like in the other scenario. And we deferred spending our dividend income each year and reinvested it. No other work on our part! If you know anything at all about compounding interest, then you probably already know that time is critical. The more time your assets have to compound … the greater the impact compounding interest can have. For example, in our real-life scenario described earlier … we saw a good amount of growth from reinvesting our ED dividend income back into additional shares of stock. This was compared to just taking the company dividend increases each year. Those numbers were somewhat convincing … but it was only for 10 years. What if we extended that comparison out over 40 years? If we were to take the 10 year Dividend Growth Rate of 1.8% for ED and extend it out over 40 years … we would be earning $144.90 in annual dividends. That is a little more than double our first year of dividends. Note – If you want a quick way to calculate how many years it will take for an investment to double, try the Rule of 72. You simply divided 72 by the annual interest. For example, a 1.8% annual return would take 40 years to double based on the calculation. Now, if we calculate our average annual return on our investment of ED shares with DRiP … we can compare where our dividend income would be in 40 years. To do this, I took the average increase in dividend income per year we actually received over the past 10 years. With company dividend increases and our own dividend reinvestment’s, I was able to calculate an annual average return of 6.64%. That is just a back of the envelope estimate. If we plotted out a 6.64% return over the same 40 year time period … our investment would earn us $1,495.54! WOW! And using the Rule of 72 calculation, this investment would double every 10.8 years. It is not a coincidence that our original investment is going to double in just under 11 years time! That is $1,350+ more per year by simply reinvesting our dividends and deferring our income until later. The graph below gives you a visual representation of this amazing compounding growth. 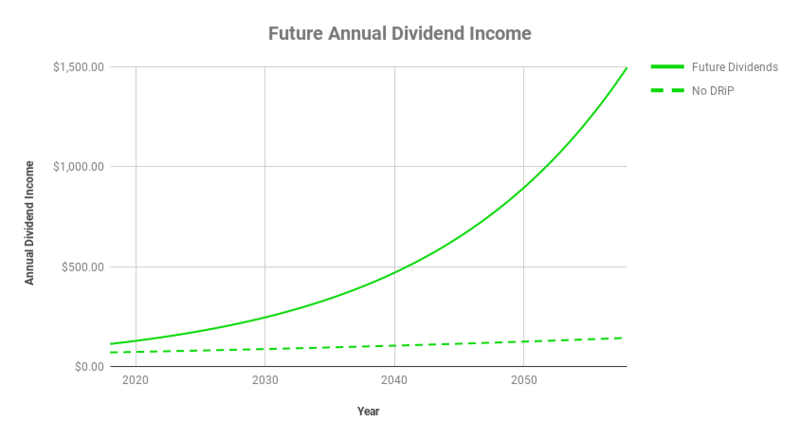 The solid green line represents an estimate of our dividend income over 40 years with reinvestment. The dotted green line shows no DRiP. I’m sure most of us have seen the compounding interest calculations and graphs posted around the internet. Things like “… invest $5,000 for 40 years at 7% and be a millionaire …”. There is nothing wrong with those calculations as they are right on in what they are saying. As a dividend income investor though … I like to think of things a little different sometimes. For example, I am not as concerned about how much our investments value grows year to year. 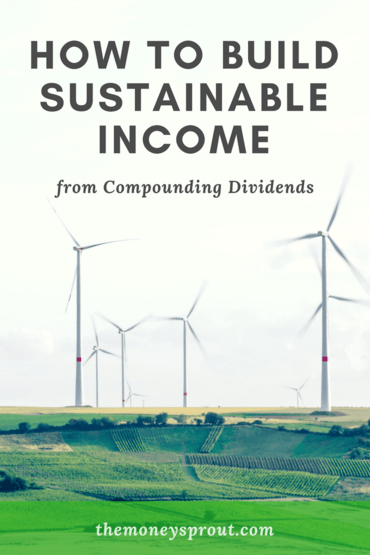 Although important, I am more concerned about building a sustainable dividend income stream. I want to know that my income stream is growing every single year. And two of the best ways to have an income stream that grows is … first by investing in quality companies that give you a raise each year (hopefully at 6% or higher). And second … is to reinvest your dividends for as long as you can hold out. The 40 year scenario shown above should be the only motivation I need and you too. Compounding interest works for dividend stocks too! What do you think about compounding interest? Would you rather just spend your dividend income or investment earnings? Or would you prefer to defer that income and reinvest it for a bigger pot of money in the future?